← VEGAS BLACK OPERATION: Whodunit! And how? 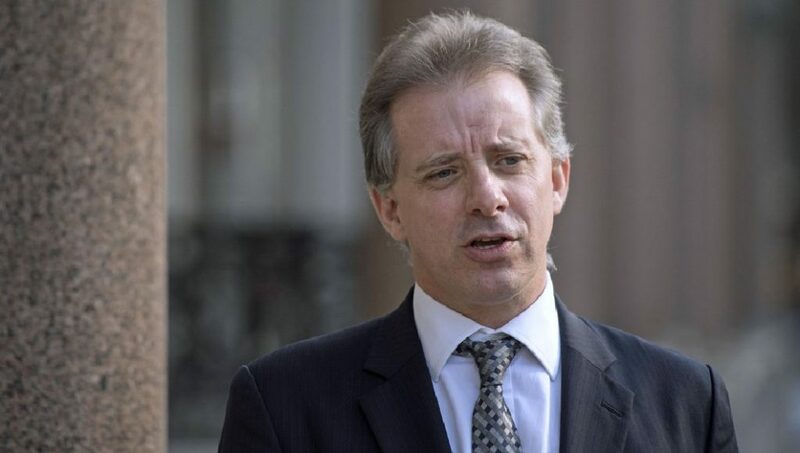 Christopher Steele, former British intelligence officer who worked for MI6 and produced the fake Trump-Russia dossier for Fusion GPS. In their joint effort to ensure a Clinton victory (and a Trump loss), a transatlantic partnership was secretly formed at the highest echelons of the American and British Governments. In so doing, webs of intrigue were woven to first entrap the Trump Campaign; and then to ensnare the fledging administration post Inauguration Day. In the interest of inflaming suspicions about a non-existent collusion between the Russians and Team Trump, Dossiergate was born. The burning question on everyone’s mind is: Why did the Democrats risk so much by floating the bogus “Trump-Russia collusion” story when they knew it was patently false. They were exceedingly desperate. Not only to explain their historic loss at the polls (think Podesta); bit also to deflect the inevitable accusations of sheer corruption when their own Russian Scandal was blown wide open as is happening now. The Democrats under the Clintons and Obama have so much naked criminality that their only way out was to go on the offense. Truly, it doesn’t get more sordid than Dossiergate in the political and espionage realm on either side of the Atlantic. Not only were the false allegations against President Trump quite purposefully concocted, they were prurient and scurrilous, salacious and lascivious for a very specific reason. In point of fact, these fictitious allegations were deliberately manufactured with the intent to deceive the American people and the U.S. Congress. And so they did. KEY POINT: It’s a very common tactic of the U.S. Intelligence Community, especially throughout the American political realm, to take down a targeted politician with explicit accusations of sexual misconduct. The C.I.A., NSA, DIA and FBI have used this technique of personal destruction practically forever. They know that the historical puritan mindset of many voting citizens does not tolerate this type of wrongdoing, particularly on the Right. They even took down President Clinton using his own outrageous sexual exploits –perpetrated in the White House — against him. As a matter of historical fact, the British never left the Thirteen Colonies after the Revolutionary War. Herein lies the real problem. 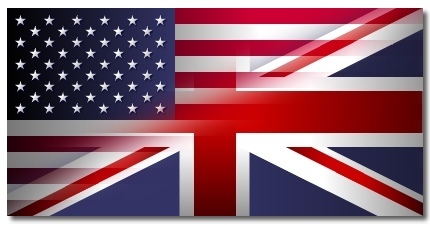 Very few really understand the true nature of the Anglo-American ‘special relationship’. It’s very special alright because the United States of America is still a colony of the British Empire. Just because the empire has been replaced by the “The Commonwealth of Nations” doesn’t mean it is not very much alive and working…toward the financial enslavement of humanity. The two primary control mechanisms by which the Brits have successfully exercised total control over the U.S. Government, Inc. are financial and legal. Of course, on paper — the paper that no one has ever seen before — the U.S. Federal Reserve System is, at its core, a British-Rothschild banking operation. Yes, there are several other international stakeholders in the Federal Reserve criminal banking syndicate, but at the first level of clandestine administration, it’s fundamentally British and headquartered in London. In reality, the Brits own and operate the U.S. Government, Inc. as though it was the British East India Company of the 17th century. While such a statement may seems incredible, it’s absolutely true. 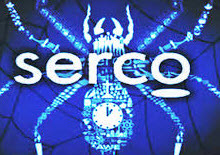 In fact, from a strictly financial and legal viewpoint, there is a British Company doing business as SERCO, Inc. throughout the United States that literally controls much of U.S. Federal Government. The following exposé clearly delineates the depth and breadth of this relatively unknown British enterprise. With this greatly expanded understanding, it ought to be much easier to apprehend the sheer enormity and profundity of the takeover of America by our British overlords. And, by the way, SERCO, is only one of hundreds of multinational companies headquartered in London which own and operate half of Corporate America. Not only was this achieved through outright stock ownership, the covert side is implemented through transparent overlapping directorships, secret offshore banking relationships, shareholder proxy wars, and many other ways of stealthily taking control of a publicly traded corporation. First, that this inexorable process of taking complete control of the 50 states and territories began in 1776. Actually, the Brits had already owned — lock, stock and barrel — as they like to say, the colonies from day one. So maintaining, and implementing further, such tight control was really quite easy given that most of the lockdown took place completely under the radar. When you have 240 plus years to lock the whole place down, how difficult will it be when you effectively own the banks, developed all legal process and procedure, and own all the root technologies? There is no other press corps on Earth as proficient in the art of fabricating war propaganda and fictitious narratives as London’s Fleet Street. This is where all of the major wars waged across the planet since 1600 both began, and ended. No other language has ever attained the global status as English has. Of course, this significant fact of life was guaranteed by the unrivalled length and breadth of the British Empire. The bottom line here is that wherever English is written or spoken, you know who the real boss is. That’s because once power of that magnitude is acquired, it doesn’t ever change hands. It may appear to, but it really doesn’t. In light of these stark realities, it should come as no surprise that there is no other nation that has meddled in the affairs of the United States like Great Britain. A quick scan of the London dailies will clearly demonstrate that myriad headlines are still directed at their former colony. A careful analysis will demonstrate that many of the most fallacious stories about the US government and American society are generated by the British tabloids, which then find their way onto their mainstream media platforms; albeit, in a much more acceptable format. Simply put, there is no Media Industry anywhere that can cook up a dish of pure BS, mixed with mendacity, seasoned with utter falsehoods and garnished with libel like the Brits. It’s almost as though these folks (the stone-cold liars among them aka presstitutes) were hardwired to lie at birth—for real! They are also great weavers of webs of lies and deceit (when they’re not in the kitchen) creating whole tapestries with their characteristic threads of disinformation and misinformation, prevarication and equivocation, deception and misrepresentation. The 2016 presidential campaign season saw the British press go into gear like never before. From the very day that Donald Trump announced his candidacy, the London press has torn him apart like a school of piranhas. When they weren’t doing that they were stinging him like a massive swarm of angry hornets, bees and wasps. Every time you opened one of their news websites, you would instantly see that Trump fell into yet another snake pit, right after somehow escaping from the lion’s den. If there is any doubt about this dubious journalistic phenomenon, please see for yourself. The SOTN staff visits the British MSM sites before any other early every morning. In this way we are forewarned about the day’s coming storms that are blowing across the pond. It’s become self-evident that the British journalists, working in concert with their partners in the intelligence community, receive their talking points from on high. Those key points then inform the rest of the world’s press about how to proceed with their hopelessly dishonest reporting. The election of Donald Trump reflects a great failure for both the British and American media corporations that take their direction for the U.S. and U.K. Intelligence Communities. This gross failure is where Dossiergate found its beginning. Dossiergate was actually a joint project started by both the British and American spooks. After 8 years of Obama, and 6 years of PM David Cameron, they knew that a LOT went on that crossed every line of legality, propriety and morality. Obama’s lawlessness is well known and documented the world over, as was Cameron’s willingness to accommodate the New World Order agenda. Hence, the last thing the spook community wanted to see was Dudley Do-right, in the form of a President Donald Trump, riding his horse to the White House every day. So what did they do to prevent this eventuality? What didn’t they do?! Really, the spooks pulled out all the stops. They broke every law and any law that stood in their way to preclude a Trump presidency. The GHCQ scandal is only one very serious collusion between the CIA/NSA and MI6/GHCQ. Wiretapping a presidential candidate by the CIA-NSA leadership, using the GHCQ for plausible deniability, is only the least serious of espionage crimes that were committed. If ever there was a highly organized conspiracy between the British intelligence and their American counterparts, Dossiergate is it. That the Brits would be so recklessly bold as to produce such an obvious hit piece full of bogus evidence and counterfeit claims shows just how impervious they believe they are to American justice. Of course, the critical part that the false dossier played was simply to jumpstart the witch hunt against the Trump Administration and Putin’s Russia. And that it did. What is particularly fortuitous for Trump is that the scandal seems to have sucked in a “Who’s Who” of NWO globalists, all of whom are dyed-in-the-wool agents of Deep State. 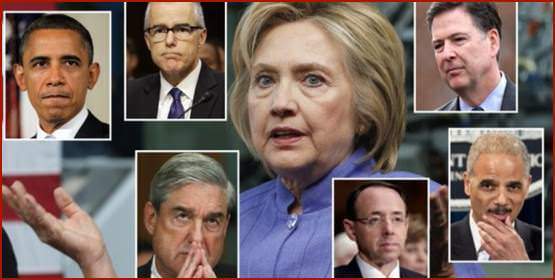 You name them — Barack Obama, Hillary Clinton, James Comey, Robert Mueller, Eric Holder, Loretta Lynch, Susan Rice, Rod Rosenstein, Andrew McCabe and others have all been stung by the Dossiergate sting. However, the really crucial issue here is the extent to which the British control the American side of espionage, as well as manipulate the counter-espionage function to accomplish their subversive goals. The simple point of fact about this ever-unfolding joint black operation is that it has been going on since day one. The day that Trump declared his candidacy they all mobilized against him. Irrespective of all the evidence showing clear-cut British interference in the 2016 election, everyone is still screaming about Russia. The longer the Mueller investigation goes on, the more Team Trump is exonerated … and the British are appropriately incriminated. And, yet, the British intelligence is so adept at controlling the MSM narrative that all one will ever hear is about Russia, when it’s really not-so-Great Britain that was truly responsible for such a crazy electoral process and post-election chaos. Or, is it that “time” has turned the tables on the British and their American co-conspirators? Exactly how deep and broad a scandal that this Anglo-American cabal has perpetrated will likely never be known; nor has one so revelatory ever occurred in world history. By that, it should be understood there has never been an instance whereby hard evidence exists on the global Internet, for any digitally connected individual to read and view, which so conclusively incriminates the C.I.A., NSA, FBI, DNC, Clinton Campaign and Obama Administration. Likewise, the same evidence points directly at the GCHQ, MI6, MI5, as well as the cottage industry of British cyber-spooks such as Fusion GPS. The blatantly erroneous oppo piece produced by Fusion GPS will go down in history as the moment the Brits got caught with their pants down … all the way down … where they remain today. No one has ever seen anything like the fake dossier that Christopher Steele made up out of thin air. That he or Fusion GPS would ever attach their names to it is equally perplexing as the Brits do not tend to be so sloppy; unless, the extraordinary sloppiness was by purposeful design. Now perhaps that’s the real story! 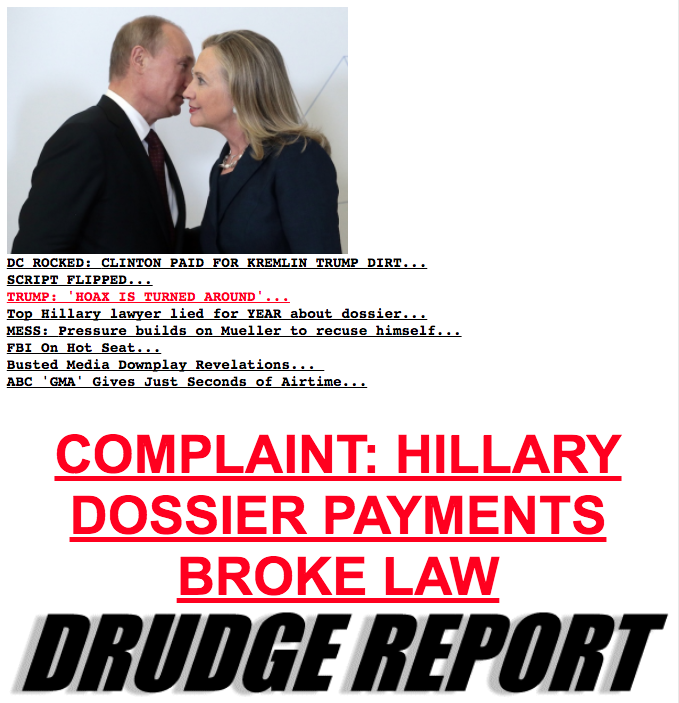 And the proof of this hidden back story can be found in the following headlines posted at the DRUDGE REPORT on Wednesday, October 25, 2017, as seen in this screenshot. It’s certainly not the Russians we ought to be concerned about; it’s the bloody Brits. And, yes, the British monarchy and government are completely controlled by the Rothschild banking dynasty. However, it’s the British Crown Temple that wields the most power over the USA. Who, pray tell, does the British Crown report to? For the uninitiated, this exposé delineates only one layer of command and control of the Global Control Matrix. The still functioning hierarchy of the British Empire actually represents a relatively low level of planetary administration. The World Shadow Government is actually composed of many levels of leadership. The British Monarchy has always been overseen by the Roman Catholic Church (i.e. the Vatican), although history has been intentionally written to indicate otherwise. The first corporations within Christendom were incorporated in Northern Italy, not London, centuries before the 1600 founding of the notorious East India Company. At the corporate level, the Vatican and Roman law ultimately dictate, but this connection is hidden from the masses. There are several more layers of leadership above the Vatican. For example, the Black Nobility still exercises great power and influence in worldly affairs, as do the Jewish bankers who grew rich from the global trade and commerce which occurred in the wake of Marco Polo’s travels to the Orient.